« Ricoh just bought Pentax for $124.2 million! This 2001 Pentax roadmap confirms that the Pentax Q and the Pentax NC-1 are just different names for the same camera. 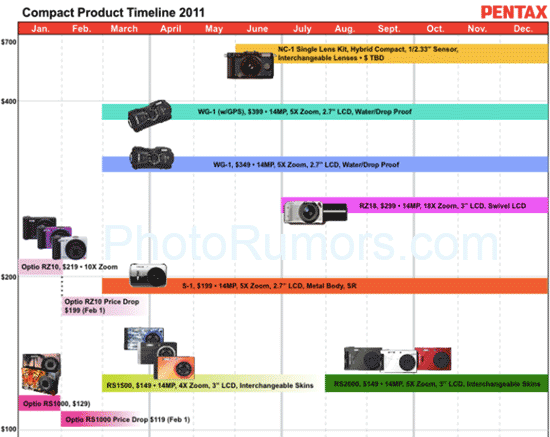 Except the two new P&S cameras, there are no other announcements scheduled till the end of the year, but keep in mind that this roadmap is labeled "Compact Product Timeline 2011". The information I received still indicates that a second interchangeable lens camera from Pentax will be announced later this summer. Maybe the rumored Pentax Auto 100 digital is part of the DSLR roadmap (not listed here). The second camera is expected to be based on the Pentax Auto 110 which is not really a mirrorless solution. Expect an APS-C sensor inside and computability with old Pentax 110 lenses. This entry was posted in Pentax and tagged Pentax Auto 110 digital. Bookmark the permalink. Trackbacks are closed, but you can post a comment.